NEW YORK (WABC) -- Verizon Wireless customers in the New York City area experienced an outage impacting calls Monday evening. Multiple Eyewitness News viewers reported that they could not make or receive calls on their cellphones. The reports came in from Long Island to New Jersey, and including New York City. Eyewitness News reached out to Verizon to see what happened. Andrew Testa, a Verizon spokesman, said the problem started just before 5 p.m.
"At 4:50 p.m., Verizon experienced a network issue affecting voice service for some customers in New York and New Jersey," Testa said. "Verizon Wireless engineers were able to identify and resolve the issue promptly and service was fully restored by 6:30 p.m."
Testa added that the cause of the outage is not yet clear, and they're working to figure it out. 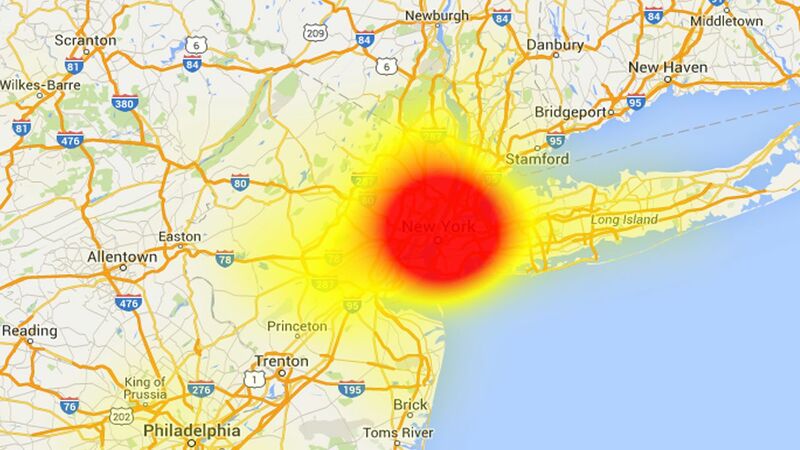 The map above shows where reports came into downdetector.com, which tracks service outages across the country. @VZWSupport Is there an outage in the NYC/NJ area? Can't make outgoing calls on our mobile.